When it comes to wild salmon, the era of full-spectrum culinary versatility is upon us. The omega-3-rich king of the sea that was once merely relegated to just the standard bagel-and-schmear situation has o-fish-ially grown up gastronomically—and we’re here to not only celebrate this, but to help spread the gospel. That said, we’ve put together a quick hit-list of some of our favorite wild salmon recipes from around the web. From the no-fuss to the here-to-impress, and everything in between, below is our go-to arsenal of salmon scenarios that are sure to wow even the most discerning palates. And if you're ready to buy some of the best wild-caught sustainable salmon on on the planet, click here. Before jumping in, a word to the wise: take every cook time recommendation here with a grain of salt. Wild salmon cooks faster than the farmed stuff because it's leaner. As a rule of thumb, check on your salmon early and often until you get it right. We find that if the recipe calls for pan frying, 3-4 minutes on medium high heat for the skin side and flesh side does the trick. If using a conventional oven, 8 minutes at 425°F typically leaves you with a juicy fillet. This summer-bod-friendly Food & Wine recipe is simple and quick—without skimping on flavor, texture or complexity. Herby, nutty and zesty makes for a perfect trifecta of flavor for this Bon Appétit recipe of butter basted salmon with hazelnut relish. We’re looking at you, Keto people. Martha Stewart was literally born to master the wild salmon burger patty, and she nails it with this super-easy flavor profile. And if you’re on the hunt for a superfood health patty, this Skinnytaste salmon quinoa burger recipe is all you. It doesn’t get cozier than wild salmon chowder, and this Epicurious recipe is the kind for which you’ll likely also want slippers, a fleece robe and a crackling fireplace. No one does effortless chowders like Alaskans, so if you’re looking for a no-frills, genuine ace move, try The Alaska Life’s rendition of a classic wild salmon chowder. Leave it to Ina Garten, aka the Barefoot Contessa, queen of the chic shindig, to offer up what we think is one of the most delicious wild salmon tacos recipe out there. Spicy. Herby. Perfect. We’re sure her husband Jeffrey agrees. Nothing says party like a tray of sliders, but when you show up with this Coastal Living recipe of sockeye sliders with wasabi-ginger aioli, you’ll literally have to shoo your guests out of your house. And if you want to wow your crew, bust out the cedar planks for that aromatic, woodsy flavor profile reminiscent of epic camping trips. Epicurious has an easy one that perfectly balances with savory and just a touch of sweet. Here's our own no-frills recipe for pan-frying wild salmon that it literally easier than frying an egg. And this 5-ingredient recipe - using butter, honey, garlic, honey and soy sauce - has all your flavor bases covered. It’s amazing what Thai green curry paste, coconut milk and a bunch of veggies can do to a filet of wild salmon. This Martha Stewart spicy coconut salmon curry is basically a vacation. If you’re a fan of sweet, spice and tang this Javanese roasted salmon and wilted spinach situation by Epicurious demands your attention. The title of this Half-Baked Harvest hoisin caramelized salmon and sesame soba noodle bowl recipe is clearly a mouthful—and you’re going to want about 8000 mouthfuls when you get a taste of this elegant Japanese-inspired flavor profile. 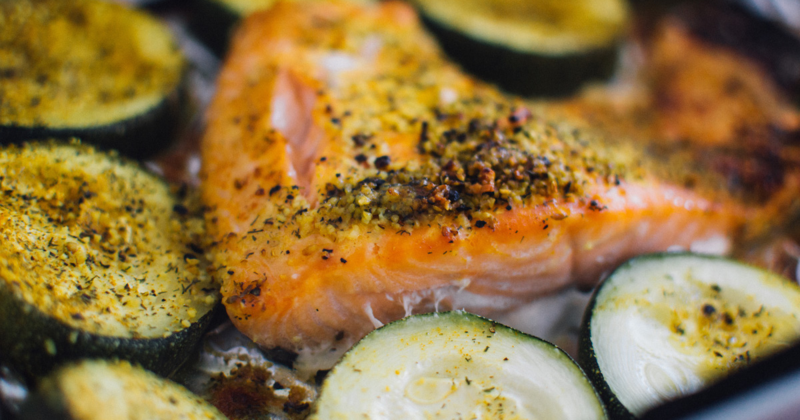 If you’re looking for a jolt of savory, creamy flavor that comes together faster than you can say feta and herb crusted salmon, go straight to this recipe by The Laughing Spatula. Here’s a bright, robust recipe for almond-crusted salmon from Layers of Happiness that will make you feel like you’ve arrived as the guest of honor at your favorite restaurant. Salmon mousse is basically a more grown-up lox spread. Sunset’s recipe is easy, curried, creamy and just the thing to slather on bread, crackers, veggies—or do what you really want to do: eat it with a spoon. This creamy wild salmon with kale recipe by Epicurious is big and bold without being overbearing. Did someone say salmon fried rice with cabbage and carrots? Yup—Food & Wine did. This is one of the most innovative ways to recast the seafood element of such an iconic dish. Great as a main, a side, for breakfast, lunch or dinner. Coastal Living brings the sunshine in with this mango-glazed salmon recipe that fuses star anise, cinnamon and ginger to make that salmon fillet a legit slice of the tropics. Click here to buy quality wild-caught, sustainably harvested salmon from some of the best fisheries in Alaska.